The lands of the state range from sea level along the coast to the mountainous Appalachians to the west. The Europeans came with the Spanish to the region when Fort San Juan was built in the interior region in 1567. Additional forts were built, but nearly all wiped out by the Native Indians. The Spanish ended their colonizing effort in the southeastern interior region of North Carolina. The Native Indians were Cherokee and Catawba, along with many smaller tribal groups. The earliest English attempt at colonization in North America was the Roanoke Colony of 1584 to 1587. It was near North Carolina’s Outer Banks. It disappeared without any clue as to what happened to the colonists. In the 1650s and 1660s new settlers, mostly English, from the Virginia colony moved south into North Carolina. Also, several runaway servants and fur trappers came to the area. Those from other regions also came south, producing 5,000 English settlers in 1700 and 11,000 in 1715. One group, was Swiss and German settlers, who established New Bern colony. By the 1740s a surge of settlers came from Virginia and Pennsylvania to wanting new lands. These were farmers, mostly of German and Scots-Irish descent. 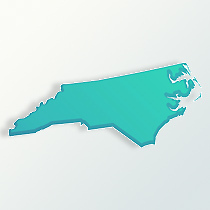 By 1775, North Carolina was the fastest-growing British colony, with many coming as indentured servants. The colony had as population of over 200,000 in 1765 with one-fourth of that number being African-Americans, who were mostly slaves. The greatest concentration of African-Americans were on the large rice and tobacco plantations along the coast. After the American Revolutionary War, where several battles did take place in North Carolina in the 1780s, the region experienced another surge of immigrates to the state. The population in 1786 was 350,000. This was from large groups of Germans from Pennsylvania traveling south into North Carolina and Scots-Irish who went to the far western side of the state. In November 1789, North Carolina became the 12th state added to the United States. Over the early 1800s, plantations increased as well as slavery. It also received numerous African-Americans migrants from Virginia who had been free people of color since the colonial period. They settled in western frontier areas of North Carolina. Up until 1835, free African-Americans had the right to vote in the state, but they were put under increasing restrictions as the slavery and racial issues increased towards 1860. It was May 20, 1861 when North Carolina reluctantly seceded from the Union. Many North Carolinians, especially yeoman farmers who owned few or no slaves, were not supportive of the Confederacy. After the war’s end, it took awhile for North Carolina to improve its economic and social standards. Racial conflicts continued through the rest of the 1800s. In studying North Carolina genealogy, the late 1800s saw the central Piedmont region developed an industrial economy that included the cotton textile industry in close-knit company towns, and timber-based furniture and building supplies in villages such as High Point and Thomasville. This opened up new opportunities for arriving immigrates. A sizable wave of individuals from Wales came to settle in Fayetteville area. With a lack of opportunities and treatment as second-class citizens in North Carolina for the African-Americans, thousands migrated to northern states between 1910 and 1940. The state’s overall population has been a steady climb. In 1850 it was 869,000 residents. By 1880 the population was 1.4 million. In 1910 North Carolina had 2.2 million residents and in 2009 sits at 9.3 million residents. A large number of Hispanic immigrants have settled in the state, mostly to work as laborers. They represent about 6 percent of the state’s population. The North Carolina genealogy in its ethnic make up is about 24 percent with English descendants and 9.5 percent of German descent. The African-American population represents about 21.5 percent of the overall population. With a growing economic the state has attracted emigrates from Asia, mostly from India and Vietnam. North Carolina has over 111,000 Native Indians. Some of the tribes are the Coharie, Eastern Band of the Cherokee, Haliwa-Saponi, Lumbee, Meherrin, Sappony, Occaneechi Band of the Saponi Nation and Waccamaw-Siouan.